The Ministry of Education, Research, Culture and Sports of the Generalitat Valenciana is hosting the 2017 European Year's commemorative day for the Education of Older Adults. 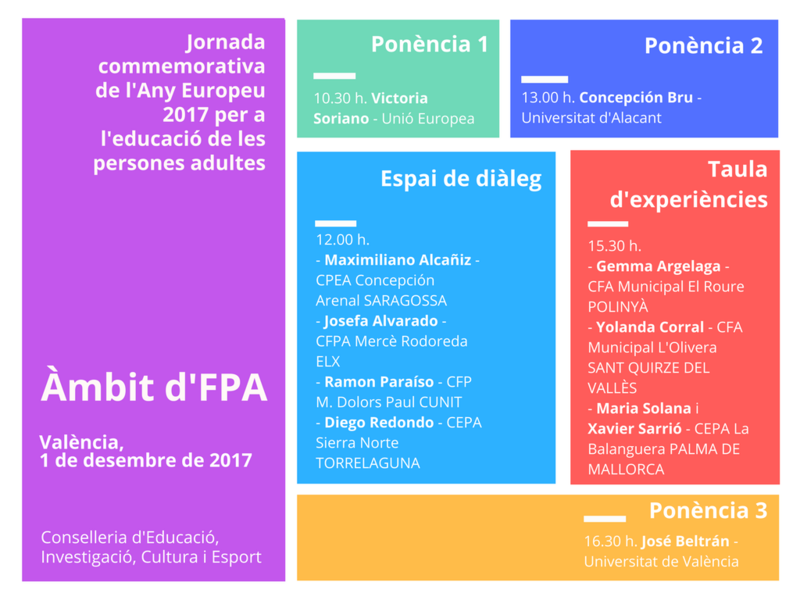 AEPUM and the Valencian Public Universities XPUM-CV's University Programmes for Older Adults Network will be attending this 2017 European Year's commemorative day for the Education of Older Adults that will take place on December 1st 2017, from 9:30h to 18h, at the Assembly Hall of the Ministry of Education, Research, Culture and Sports of the Generalitat Valenciana. Organized by the General Directorate for Educational Politics, it closes with said celebration this 2017 European Year for the Education of Older Adults. The day wants to help "reflect upon teaching activity in older adults' literacy, find out fresh methods and techniques, as well as analyse educational materials already existing in the field", by providing visibility to this educational activity. The general director of Educational Politics, Jaume Fullana, informs us "a programme has been designed that follows the six strategic guidelines put forward by the European Association for the Education of Adults (EAEA), in the 'Manifesto for adult education'." The commemorative day will analyse this formation's trajectory in the Valencian Community, and will create a debate forum for teachers' exchange of strategies and pedagogical experiences. The necessary foundations for the coordination between the education Administration and teaching centres will be set in motion, as well as promoting collaborative work and the participation of educational communities in adult education public centres. This day will start with a conference on 'Inclusion, an effective tool to fight social exclusion and discrimination', managed by the associate director of the European Agency for Special Needs and Inclusive Education, Victoria Soriano de Gracia. Concepción Bru Ronda, AEPUM's President and representing XPUM CV, will be delivering the conference "Permanent learning in university programmes for older adults in AEPUM and XPUM-CV networks: tools and current resources and new challenges for the future". Another point to reflect upon will be the FPA's General Programme in different autonomous communities. The afternoon session will include a table to discuss experiences about three innovative education proposals in older adults' educational centres. José Beltrán Llavador's participation will be closing the day, from the Department of Sociology and Social Anthropology at the University of Valencia's Social Sciences School, with a presentation on 'Active citizenship: democracy and participation'. This day is included within the learning offer of Valencia's CEFIRE, currently undergoing registration, but accessible through any of the webpages in the territorial CEFIRE networks (Alicante, Castelló, Elda, Elche, Gandia, Orihuela, Sagunto, Torrente, Vinaròs and Xàtiva). Both the general information about the day as well as access to the registration link is available through this link. Registration dates span from November 14th to 27th, 2017, both included. Confirmation dates include days 28th and 29th of November 2017.